TORONTO, CANADA (THE WIRE PRESS) – Ask The Doctor, the world’s largest medical question and answer platform, announced today it will begin operations in China to meet the countries user-base demand. Ask The Doctor allows users to ask a doctor sensitive medical questions anonymously in any language and receive answers from a network of over 20,000+ general physicians and specialists in a few hours or less. These question and answer pairs are then published with all personal information removed to create a medical q&a library. This library is proving to be a very valuable asset for medical AI research, even used by the National Institutes of Health. 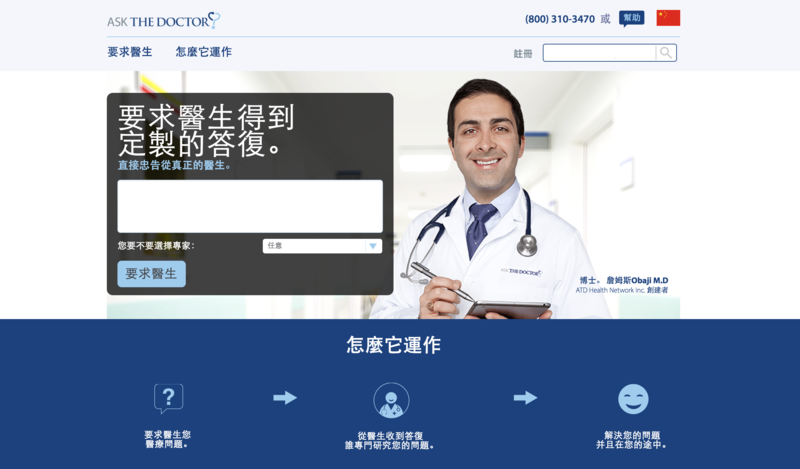 As of today, Ask The Doctor China’s main page will be in Mandarin with the Chinese Yuan being the accepted currency. Ask The Doctor also plans to convert its library of questions and answers to Mandarin over the coming year. Launched in 2010, Ask The Doctor is a digital health platform accessible to any patient with an internet connection that allows them to type a question to a General Physician or Specialist. In 2011, Ask The Doctor became an official partner of the National Institutes of Health (NIH), publishers of PubMed. The question and answer data collected provides insight into how patients communicate their health concerns and has helped identify unmet medical needs internationally. Today, Ask The Doctor is the most trusted resource for customized medical information and advice, servicing patients from nearly every country around the world.